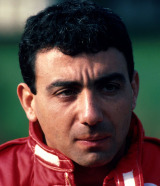 Ferrari followed from 1984 to 1988, and he won on his third outing, at Zolder, helping him to fourth place overall at the end of the season. A pair of wins helped Michele to be runner-up in 1985, but his career tailed off. He returned to Tyrrell in 1989, then crossed to Larrousse mid-season. Three thin years with Footwork followed before his worst year: 1993, with the Scuderia Italia team. The car was a beast, and Michele failed to qualify five times. A year with Minardi restored his pride, but he headed off to German touring cars to race a works Alfa Romeo. Moving on to sports cars, Michele was killed at the Lausitzring in 2001 when his Audi flipped in testing.